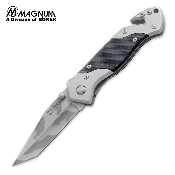 The rust resistant 3 3/8" 440 stainless steel blade boasts an eye catching camo finish. The stainless steel G-10 handle combination features a seatbelt cutter and glass breaker. Includes a pocket clip.